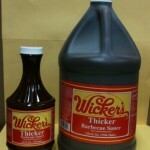 Wicker’s Thicker Sauce is what you’d call a Table Sauce. Wicker’s Thicker is similar to the Wicker’s Original Marinade & Baste but made to use as a finishing sauce on the grill, smoker or table. Hand-crafted in Hornersville, Missouri, USA, some folks even use Wicker’s Thicker ‘on the side’ for dipping. Just a hunch, but our guess is you’ll like Wicker’s Thicker Sauce so much that you’ll most likely just leave it on your table permanently.